This is the example I'm using in a social media workshop tomorrow to show my coworkers how to hide a Facebook update from a select group of friends. Who thinks they'll have a sense of humor? Me too. Before your next Facebook posting, click on the lock icon in the lower right corner and you'll see the options of Everyone, Friends and Networks, Friends of Friends, Only Friends, and Customize. The last one lets you specify people to share with or block individually. Mom - I've only been drunk on Cheez-its. Promise. ooooo! Great tip! 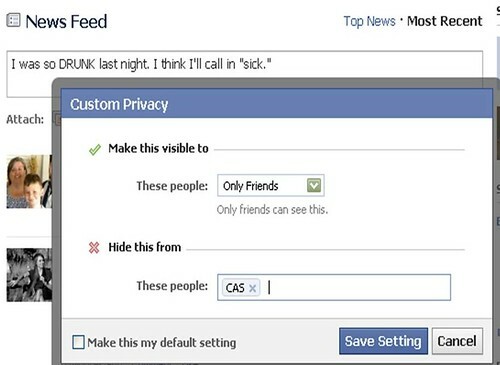 BUT....does it work if a friend who does not work at CAS comments? For instance....I don't work at CAS but I comment "Yeah, that was a great party last night but I can't believe you hopped up on that table and started dancing." Let's name your boss Mr. Nohumor. If I am friends with Mr. Nohumor, won't my comment and by extension your post show up in his news feed? Is this the post where I'm supposed to comment that social networking sites are the devil? J: Every party needs a pooper. P.S. It's you and Angie.